I like the yellow too!!!!! ...the tea light is held 1/4" above the surface of the writing tablet. Comes in handy, if you think about it. Does the coating have an effect on the capillary action? Does it speed up once the coating is burned off? Is it easy on fuel? Will it go limp once it becomes saturated with fuel? zelph wrote: Does the coating have an effect on the capillary action? Does it speed up once the coating is burned off? Is it easy on fuel? Will it go limp once it becomes saturated with fuel? I believe the coating slows the capillary action a bit compared to bare fiberglass like muffler wrap. The coating only burns off(at least so far)on sections that are exposed to open air. If the whole coating were burned off, I suspect the wicking properties would speed up some but I haven't tested the theory yet. The obvious applications to me are to use it to hold bare fiberglass mesh in place while forming wicks. It really is that rigid and the strands are all evenly spaced(just a shade over 1/8")so it's like graph paper and helps keep everything very even and neat. Take a ROF for example. One could lay down muffler wrap in whatever thickness and length needed on a workbench but leave a little extra working material. Then slap a strip of drywall tape on the top. Turn the whole assembly over and apply another strip of drywall tape. Cut off any excess with scissors, form into a circle and secure with another piece of drywall tape. This is just an example but I'm sure you see the benefit. You can make custom size fiberglass wicks without worrying so much about them falling apart or getting screwed up while installing them in the stove. That's cool Skids, do you think just using the tape would you be able to make a ROF? 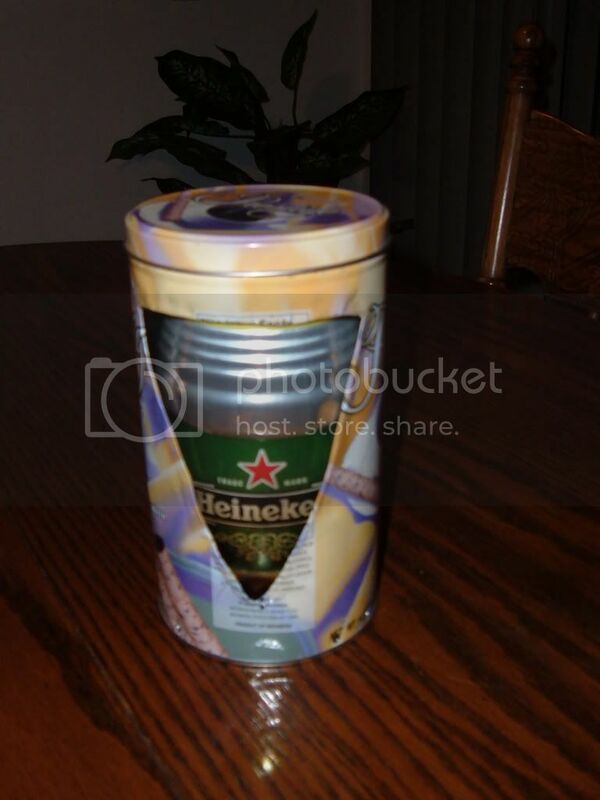 Take a Fosters can and wrap it around as many times as required to fit a container similar to the ROF? Let the tape stay on the Fosters? zelph wrote: That's cool Skids, do you think just using the tape would you be able to make a ROF? Take a Fosters can and wrap it around as many times as required to fit a container similar to the ROF? Let the tape stay on the Fosters? I was thinking it'd be worth a try for sure. I think I'll do the first test outside, if you know what I mean. Wrap enough around a fosters to absorb 3/4 ounce fuel and then cover it with a wrap of aluminum flashing or something else. Needs no bottom really, place it in a priming pan and then add fuel by pouring down the side of the fosters or pour into a priming pan and let it be absorbed by the fiberglass. So which size Heine can does everyone use? I am into freezer bag cooking so all I need is to boil water to cook with and make coffee in the morning. rigidpsycho wrote: So which size Heine can does everyone use? I am into freezer bag cooking so all I need is to boil water to cook with and make coffee in the morning. 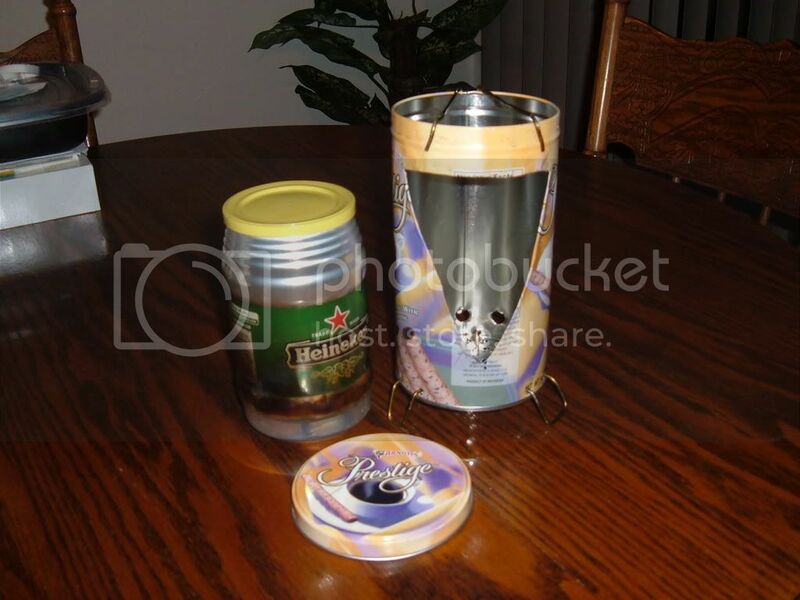 Fits perfectly on a 24 oz Heineken can, or a Fosters can, or a stove made from a Foster's can. Ridgerunner wrote: Coffee can stove is out---too short. Did some serching at the thrift store and came up with this 9 cent tin. The lid is tight which is good. Never seen this brand at my store but I think Pepperidge Farm has the cookies in a tin. Price is kind of salty but the cookies are excellent--anyway check it out. 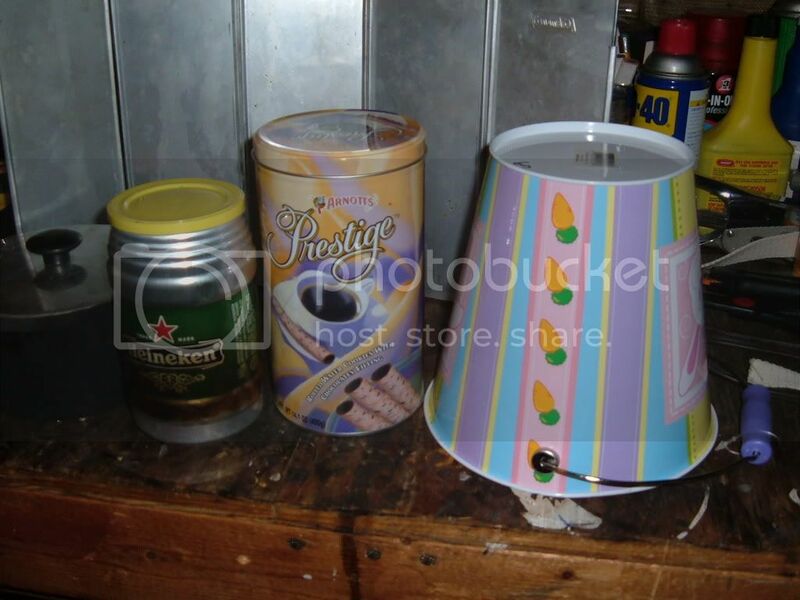 The yellow snap-on Heine lid is from Hersheys chocolate syrup. Made thepot support thinking of the kmart grease pot. I will rebend to have the Heine slightly recessed into the stove while cooking. And low and behold, it fits inside for a multi-purpose container. Just a reference and pic of the Hershey lid mentioned earlier in the thread. I found the Hershey lid easier to snap on than the Tarts tin lid but you can cook with that lid.